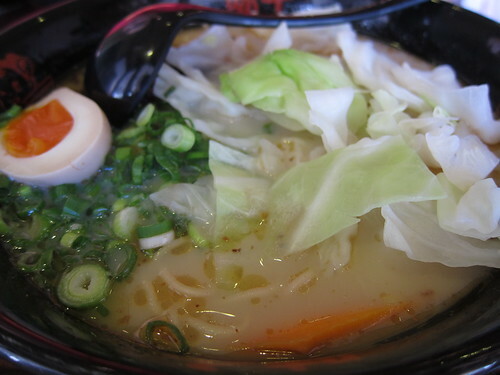 Ajisen Ramen – Glen Waverley | ohdenny. 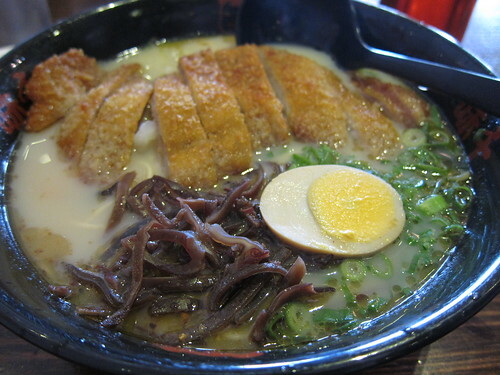 Ajisen Ramen is a popular Japanese franchise that offers an array of Japanese dishes. Of course, going by the name, its main attraction is the Ramen. Ajisen Ramen’s first Melbourne restaurant was on Bourke St, Melbourne. It has been there for many years, I think ever since I was in high school. I remember my friend ordering an Aussie Ramen, it was one of the strangest fusion dishes I’d ever seen. I believe it had fried egg, beetroot and other “typical” Australian ingredients like you’d find in a burger. I don’t think it’s on their menu anymore, probably an indication of its extreme popularity. Ajisen Ramen is a more recent entry to Glen Waverley, after the seemingly empty Korean restaurant before it closed down, and most weekends during lunchtime, even in the late arvo, you’ll find this place full. I ordered the Tonkatsu Ramen, as seen in the opening image. What we have here is Deep-Fried Pork, egg and an assortment of vegetables. I quite liked it, you kinda to either eat the pork quickly or take it out of the bowl in order for the pork to retain its crunchiness that you would typically find in a Tonkatsu Rice dish. If you leave it in too long, it kinda gets too soggy but the flavour is still there so if you don’t mind it then it really isn’t a con. The soup is mild, but definitely has some flavour. I quite like it and even though the bowl appears a tad small, it is filling. This is the Spicy Ramen, with “Spicy Meat” which is not pictured. It’s servered separately on a plate. This is slightly different to the Tonkatsu Ramen as the soup base is spicy. It actually has quite a good hit, and it’s served with cabbage instead. Overall, it’s pleasant and the amount of heat is surprising for a Japanese restaurant. If you order a Sumo Combo, ($5.50 extra) it comes with your pick of Junior Donburi and Green Tea. Well worth it if you’re particularly famished. 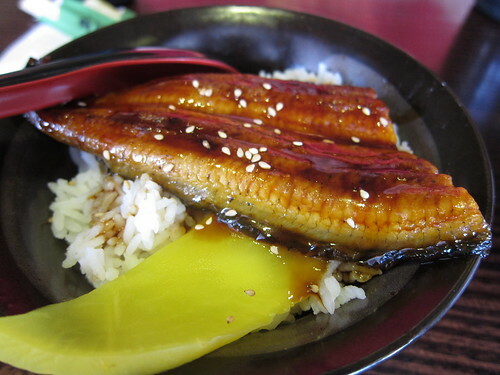 Here we have the Junior Unadon, which is Grilled Eel with Sauce on Rice. I’m not a big fan of eel, but the sauce makes all the difference here. Nice balance of sweet and salty. 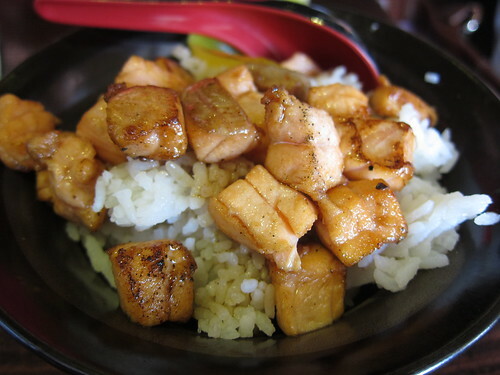 Here we have the Junior Teriyaki Salmon Don. I find the Junior serves if you don’t order the Sumo to be extremely poor value for money. It really is just a few mouthfuls, and for only a couple of dollars more you get a much larger serving. I also found the Teriyaki sauce here to be lacking, its mainly because the sauce is almost non existant! The Salmon was nicely cooked though, still pink inside so not overcooked. So overall the dish is a bit bland. 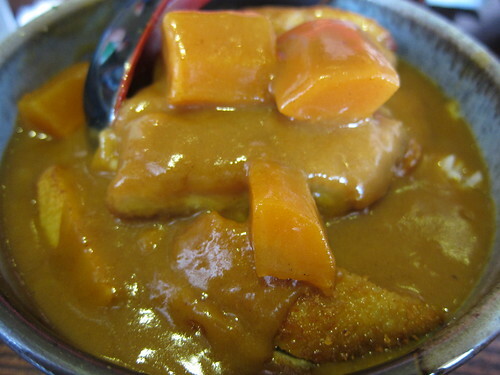 I ordered the Katsu Curry, with Deep Fried Bread Crumbed Pork with Japanese Curry on Rice. I love Japanese Curry, it’s so different to the Malaysian-style curries that most people have come to love but it for me, it holds its own. I find Ajisen Servings to be slightly smaller than most other Japanese restaurants, even the Japanese Cafe in Chinatown is gigantic compared to here but nonetheless it’s still filling. I just find that it’s generally more expensive but smaller portions. What I love about Ajisen’s offering is that it’s actually spicy! Not just a hint of spice but a good punch. So different to the standard curries I’ve ordered around town as they are usually much sweeter. The Pork goes really nicely with the curry, and although the curry can make the battered layer of pork soft, it isn’t too bad. Compared to the Tonkatsu Ramen, it goes soft slower so it’s not too bad. With this you get your standard diced carrot and potato. In this case, they pre-fry the potatoes giving it a slightly potato fry kind of flavour to it. It’s a subtle but nice way to bring another element to the dish. Overall, you can see why Ajisen Ramen is extremely popular day in day out. I’d say service is surprisingly decent too, they have these little PDAs to take your orders and the food comes quickly enough. I’d probably bet they just want you out of there as quickly as possible but it works well. As I’ve cautioned before, if you’re used to the large servings in the many other Asian restaurants in Glen Waverley, don’t expect them here. It’s slightly smaller and more expensive. However the major plus is that the food is pretty darn good. So if see empty seats in this popular eatery, grab it and enjoy!